Do you wake up feeling more tired than before you went to sleep? Is your snoring affecting your partner’s sleep, too? Are you ready to stop snoring in Garland? If you answered “yes” to any of the above questions, you could be one of the millions of Americans who need treatment for sleep apnea and snoring. And there is good news! You can find a solution for sleep apnea and snoring more easily than you might think. Sleep apnea is a breathing disorder that causes its sufferers to stop breathing throughout the night, cutting off the flow of oxygen to the brain. The most common form of sleep apnea is OSA, or obstructive sleep apnea. It happens when the lower jaw and tongue become so relaxed during sleep that they collapse, partially or completely blocking air. People with this type of sleep apnea may toss and turn throughout the night, never fully going into a deep sleep. 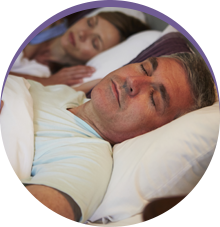 OSA occurs side by side with loud, chronic snoring. All obstructive sleep apnea sufferers snore, but not all people who snore have obstructive sleep apnea. To receive the diagnosis and treatment you need as soon as possible, learn about the warning signs of OSA and do not hesitate to see a doctor or visit a sleep clinic if you suspect you need professional help for snoring or sleep apnea. 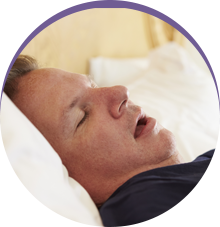 Left untreated, sleep apnea takes a toll on an otherwise healthy body. Cardiovascular health may suffer, stroke risk increases, and anxiety and depression can occur as a result of poor sleep. Fortunately, a qualified sleep dentist can treat sleep apnea with a removable oral device. It’s small, custom-fitted, and works by holding your jaw in place while you sleep to prevent its collapse and help you sleep without interruption. 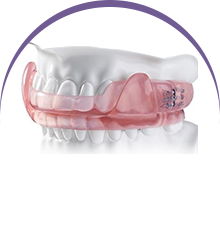 Oral appliance therapy is a wonderful alternative to CPAP, or the continuous positive airway pressure machine that can cause more interruption than the original sleep apnea symptoms. Whatever treatment is right for you, visiting a sleep dentist can help you sleep throughout the night once again! Dr. Keane Fedosky has been providing high quality dentistry in Rowlett for over 20 years. He is passionate about the treatment of snoring and sleep apnea. To learn more about these conditions or how they can be treated to help you stop snoring in Garland, we invite you to contact the office at (972) 496-0515.